Andy Weir‘s (@andyweirauthor on Twitter) book was so much stinking fun to read. I can’t say that enough. I walked around for weeks after I read The Martian, just trying to get others to read it. The story was great. They nailed the bookcover with the shiny paper. The whole package. I don’t care if you don’t like sci-fi books. This was such a good read that you just want Mark Watney to survive. And now the movie is coming out November 25th! I have yet to see a movie that I enjoyed as much as the book, but after watching The Martian trailer which came out today, this could be really close. I think Matt Damon may have the ability to deliver the snarky brainy lines just as I heard them in my head. Fingers crossed. 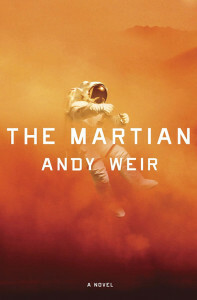 And if you haven’t read Andy Weir’s The Martian, you should really give it a try before the movie comes out.